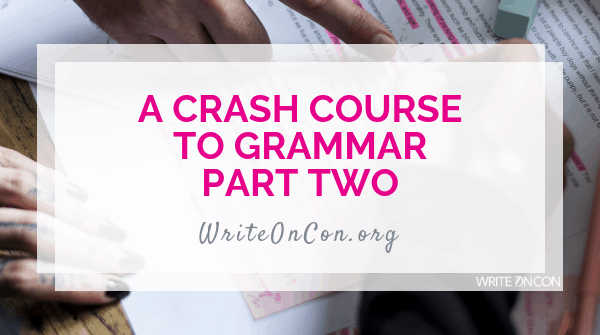 Last week, I went over some basic grammatical rules. For part two of this series, here’s a cheat sheet to some more common mistakes. “I never want to see you again,” the chiropractor said. “I never want to see you again!” the chiropractor cried. “I never want to see you again.” The chiropractor’s eyes filled with tears. “He told me he couldn’t marry me because I’m ‘too difficult’,” Bob complained to the bartender. Willa was sick of her “friends”, with their backstabbing and their mind games. This sentence suggests that Willa’s “friends” aren’t actually her friends. This makes sense here. Willa was sick of school and learning from “books.” Willa might have a legitimate critique of the educational system, but presumably she is not suggesting that the books in question are not actually books, which is what the incorrect quotations here would imply. For singular nouns, the quotation goes before the -s: “Jamie’s”, “Dad’s”. If the noun ends with an -s, put an -s after the quotation: “Jamie’s”, but “James’s”. For plural nouns, only use one -s and put the quotation mark after it: “dad’s” for one dad, “dads’” for multiple dads. Rotting and stinking to high heaven, the inspector examined the corpse. The inspector examined the corpse, which was rotting and stinking to high heaven. Farther for physical distance (“Los Angeles is farther from Sacramento than from Pasadena”); further for figurative distance (“I got a B+ on my paper because my teacher said I could explore my thesis further”). An easy way to remember: farther for physical distance contains the word far. 1) An apostrophe represents a contraction, i.e. an abbreviation of two words into one word. So It is = it’s, you are = you’re, they are = they’re. It’s a trap! You’re a doofus! They’re here! 2) Its, your, and their, on the other hand, are all possessive. “I love the mall because of its air conditioning”; “Your dog is peeing on my leg”; “Their spaghetti is moving.” To remember “their” vs. “there”: remember that the possessive “their”, like “your” or “her”, ends with an -r.
You use lay when modifying a direct object, and lie when you’re not. Christian is lying in bed, but Christian lay Ana down on the bed. You lay the dishes down on the table, but dirty dishes are lying around the house. Annoyingly, the past tense of lay is laid, but the past tense of lie is lay (“She laid her dirty clothes everywhere”; “She lay in bed all day”). The past participle of lay is also laid (“She had laid drop cloths on the floor the night before), but the past participle of lie is lain (“She had lain on the floor and cooed ‘Paint me like one of your French girls’ the night before”). What are some grammar rules you could use help remembering?